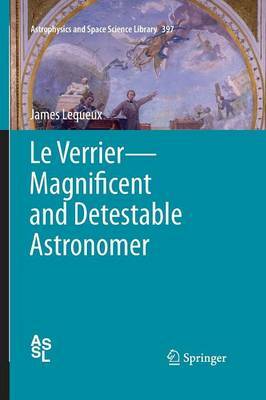 Translated from the original French by Bernard Sheehan; Edited and with an introduction by Dr. William Sheehan, a neuroscientist and amateur astronomer who is also a research fellow of the Lowell Observatory in Flagstaff, Arizona Le Verrier was a superb scientist. His discovery of Neptune in 1846 made him the most famous astronomer of his time. He produced a complete theory of the motions of the planets which served as a basis for planetary ephemeris for a full century. Doing this, he discovered an anomaly in the motion of Mercury which later became the first proof of General Relativity. He also founded European meteorology. However his arrogance and bad temper created many enemies, and he was even fired from his position of Director of the Paris Observatory.